Oh, I loooove spicy vodka! I’ve done homemade infusions but sometimes I just can’t wait 5 days for it so this is when Hot Monkey enters the picture. Unfortunately, it’s a local distillery so it will be harder to find outside of Portland. There is 5 Southwestern-style chili peppers that make this seriously hot but also flavorful without being just a hot pepper flavor. It burns going down (but a good burn) with a mix so if you try it straight be prepared for a little pain and coughing. I did. Just take a tiny sip to minimize the surprise. It is my favorite spicy vodka and the picture above is a mix of Hot Monkey and Ginger beer (not real beer) which has a kick as well so this drink packs a double punch. 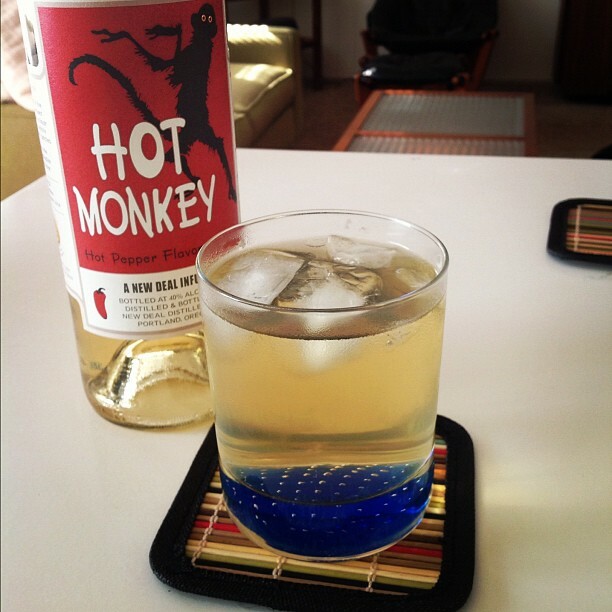 I also like Hot Monkey with Limeade (add muddled berries for something different). Blavod pronounced blah-vod is a black vodka that I just had to try and it has become one of my favorite vodkas on the market. The color derives from black catech which is extracted from the heartwood of Burmese catechu acacia trees. This vodka makes very smooth drinks and the taste is subtle yet distinct when used with other mixers. Here are two drinks to try out for Halloween. Pretty isn’t it? For a stronger taste do equal parts of each (my personal preference). Garnish with lime slice on top. Pour ice in highball glass. Pour in cranberry and float in the Blavod. Use a martini shaker filled with ice then shake shake shake pour pour pour and voila a beautiful black martini. Serve in a chilled glass. Garnish with lime.